The first Godzilla film I ever watched is one I’d like to forget: Roland Emmerich’s 1998 film. Although his oversized lizard drew me into monster films, it just wasn’t the King of Monsters people fear and revere in Japan. Thankfully, Toho – Godzilla’s creators – took steps towards introducing me to the real Godzilla in the following years. In 2005 they released the original film in the UK for the first time. In 2014 they endorsed Legendary Pictures’ take on Godzilla, directed by Gareth Edwards. And two years ago, they finally made a reboot of their own: Shin Godzilla. First released in Japan, it wasn’t available in the West until last summer, when it received a limited run in cinemas. Now it’s out on Blu-ray and DVD thanks to Manga Entertainment. Shin Godzilla is the first film in the series produced by Toho itself since 2004, and it’s made a hell of an impression. Some people enjoy it more than Gareth Edwards’ film (which I enjoyed a great deal). But was it worth the wait? While most Godzilla films are set after the 1954 film, Shin Godzilla ignores it and re-establishes Godzilla in the 21st century. The film starts in Tokyo Bay, where the cost guard investigates an abandoned yacht. All they find are a set of research notes and an origami crane. Soon after, a creature attacks and floods the Aqua-line Tunnel with its own blood. A team of government officials led by Rando Yaguchi (played by Hiroki Hasegawa) is formed to research the creature, and help the military find a way to stop it. However, the creature makes landfall and tears into Tokyo, leaving a trail of destruction in its wake. Yaguchi’s team is joined by a US envoy, Kayoko Patterson (Satomi Ishihara), who reveals that the notes found on the abandoned yacht may hold the key to stopping the creature. However, their task is made more complicated when they discover the creature can change form. Each one grows bigger and stronger than the last – and its final form could spell doom not just for Japan, but the entire world. If it sounds like a plot for an anime series, it’s because Shin Godzilla was written and directed by Hideaki Anno; creator of the Evangelion series. However, I’m not putting him down – Anno is an acclaimed filmmaker, and Shin Godzilla is a true Godzilla film. The title, in fact, means “True Godzilla”. Just as the original film drew on the bombings of Hiroshima and Nagasaki, Shin uses the recent Fukushima nuclear disaster to tell a grim story. 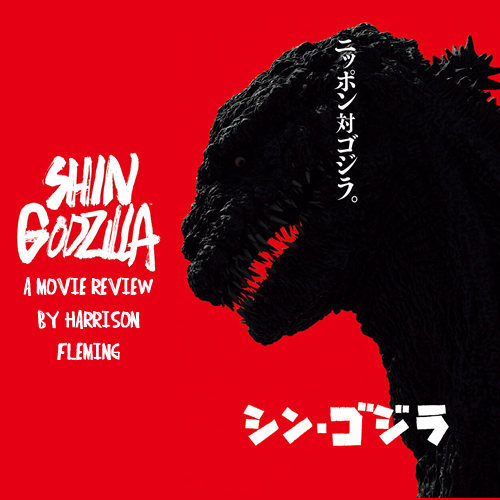 Everything from the performances to Godzilla’s attacks is portrayed seriously, and the destruction hits just as hard as it did sixty years ago. The difference is the film uses CGI to portray it instead of traditional suitmation effects. The CGI is the best Japan can offer, but sadly, it doesn’t always pay off. Godzilla itself appears in four different forms, and its first two aren’t quite as convincing as the last. In fact, despite gushing blood from its gills in the first half hour, Godzilla is more comical in its early forms than the towering terror it grows into. The film makes up for it later, however, and when Godzilla is fully grown it looks every bit as impressive, if not better than, its predecessors. I often mistook close-up shots of Godzilla’s face and tail for incredibly built suits. Fans of the series will love the effects in Shin, but if you’re new to Godzilla, you may want to lower your expectations. This version of the King of Monsters is less of a living, breathing creature than a masterful tribute to the beasts of old. It even uses the roars from the 50s’ films. If you’re expecting to see soldiers shooting recklessly at Godzilla, the humans’ portrayal in Shin will surprise you. The cast is made up entirely of politicians, and unlike most people in monster films, they don’t make mistakes out of blatant stupidity. Nor are they gun-toting action heroes. They are just ordinary people with lives, jobs, and their own agendas. Some are genuinely concerned with protecting the public, while others have their own self-interests at heart. The problem is there are dozens of them in the film, and only three are developed in depth: Yaguchi, Patterson, and the Prime Minister’s aide Hideki Akasaka (Yutaka Takenouchi). Worse, the film’s subtitles list the names of every character – even minor ones – as they appear. This makes it harder to follow the main characters, and can even cause you to lose track of the action. It’s especially hard to keep up with the film if you watch it for the first time subtitled. Thankfully, both the Blu-ray and DVD include an English dub, which I highly recommend to first-time viewers. However, with or without the dub, Shin isn’t for people looking for a simple creature feature. As well as Godzilla, Yaguchi and his colleagues spend most of their time battling red tape as they face a threat no law or procedure prepared them for. Their reactions make sense – after all, giant monsters don’t exist in real life – but they spend so much time wondering what to do that it slows the pace down. Not everyone will enjoy watching politicians puzzling for two hours. Nevertheless, it’s true to the spirit of the old Godzilla films. And if you’re willing to sit through the red tape, it’s a small price to pay for Godzilla’s return. Like all films, Shin Godzilla has its ups and downs – but it’s undoubtedly a return to form and a very different beast from Gareth Edwards’ film. If you’ve seen it, tell us what you think in the comments below or on Facebook and Twitter.